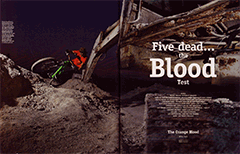 The Blood, to some a conundrum in the range, but for those who ride one, it’s a paradox that becomes abundantly clear. A tight handling trail whippet which performs beyond its image, not just a hard riding big air beasty, but a nimble trail bike waiting to kick through the corners of your favourite trail centre. You don’t have to understand, just appreciate. We love single-pivot simplicity at Orange, and the Blood is essentially a single pivot with a twist. Without getting too technical, the Blood’s ROCKR-Link is a way of achieving a highly durable 2.5:1 leverage ratio while carefully controlling the shock’s progression to optimise how the frame and shock work together. In practice this means a bike you can pedal, but one with a highly active and fast-reacting back end that delivers a super-supple initial stroke and a mid to end stroke which never shoots through its travel – perfect for those big hits. When it comes to actual rear wheel travel, it’s a triumph of quality over quantity. Ride one – you’ll see what we mean. The Blood spec has changed drastically for this year, all based on the fickle factory staff that wanted the same spec they ride. If you have your own ideas on kit, then the frame only option lets you go wild, just don�t argue with Steve�s trail spec, we�re loving it. Bottom bracket height measured from ground with 670 mmØ tyre.